I know it’s only been a month, but even with the addition of a newborn, I still hate getting up in the morning. J decided to torture me a little bit and made an 8:15 AM doctor appointment for me. The plan was for J and L to get up and go with me then we’d just go out to breakfast, but L wasn’t cooperating, so I just went by myself. By the time I got home, L was in a little better mood so we decided to go out to breakfast anyway. A few weeks ago, I suddenly realized that Crosstown Parkway went all the way to King Highway. Stupid me. I was driving all the way through town when I needed to go out that way. I don’t know my brain was thinking Crosstown stopped at the Public Safety building. 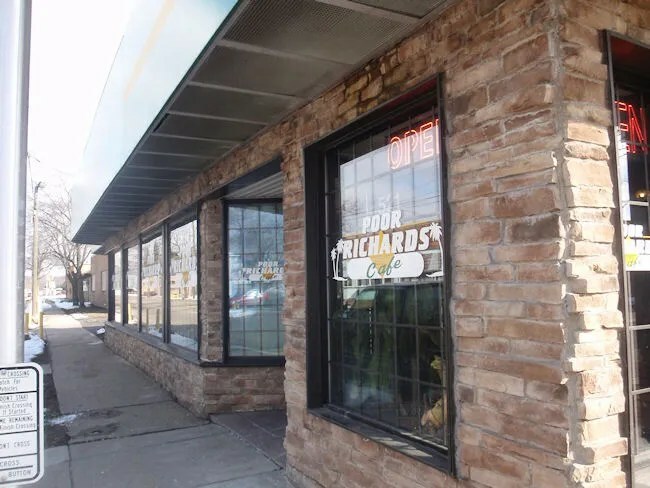 Poor Richards Cafe is on the corner of Crosstown Parkway and Mills Street. It’s a pretty large building with a green awning and entrances on both Crosstown and Mills. There are a couple of parking lots which really surprised both of us. Do they really need that much room? When we got inside, we figured out why there’s so much parking. The dining space is huge. We parked behind the building and entered off Crosstown. You come in to a huge open space with a lot of dining options. We initially headed towards a booth in the area near where we entered, but we couldn’t fit L’s car seat on the bench because the table was too close to the seat. We looked around for another spot. There were plenty of open tables, but all the tables are long ones set up for eight people. They didn’t have any smaller tables and even though they weren’t busy, it still felt odd to take up such a long table. We eventually took one of those big tables after asking if they had a high chair we could flip over to set the car seat on. We’ve learned that when we go out to eat, L sits next to me so she doesn’t see mommy. At Poor Richards, she had a lot too look at on the walls and a couple ceiling fans right above her which kept her mostly entertained during breakfast. After getting settled, the waitress brought us drinks. I got a Coke while J ordered and Orange Juice. The menus were already on the table and since we were still getting the baby settled, we weren’t quite ready to order. The waitress went and took care of a couple other things while we looked over the menu full of diner classics. I didn’t see the poster on the wall before we ordered or I would have asked about it, but their signature item is the Alaskan French Toast. I was sort of leaning towards the omelet, but then I saw the Steak & Eggs. The 8 oz. sirloin steak is grilled on the flat top and usually served with mushrooms. 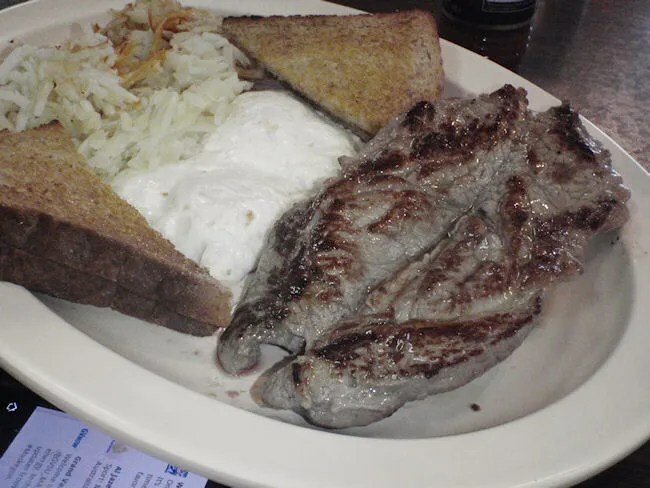 I’m really glad the waitress asked if I wanted them because it wasn’t on the menu and since I’m not a mushroom fan, I was happy to just have the steak grilled medium-rare with the great caramelization grill marks you only get at greasy spoon diners. The two eggs I had cooked over medium which left them with a soft, runny yolk. The hash browns come with the option of being cooked with bell peppers and onions. Again, very happy the server asked about the veggies. I really thought the hash browns were pretty delicious on their own. There was a lot of the crispy potatoes that I really like. The toast I got with mine was wheat toast with just of enough of the melty butter to make the wedges soft in the middle. J found the Bacon Omelet right away and stuck to that selection. 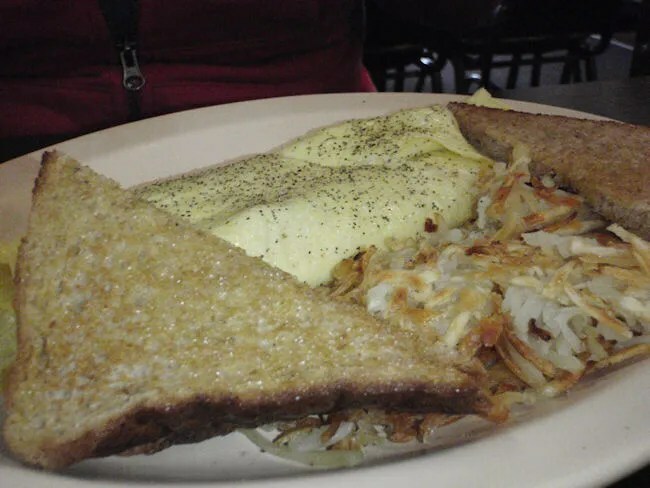 The three egg omelet is cooked with three slices of bacon and melted American cheese. I didn’t get this impression while she was eating it, but she told me afterwards that she was having a hard time figuring out if the eggs were undercooked or if it was the cheese. Instead of sprinkle cheese, they use three whole slices of American which makes it very cheesy. She also was a little confused by the three slices of whole bacon. Instead of cutting it up, they put whole slices of bacon in the omelet. She said the bacon was crispy just like she likes it, but eating was a little difficult because she now had to cut through the bacon. Her breakfast also came with hash browns and wheat toast. Our bill was just a bit over $16 and, luckily for us, breakfast was really quick. L was awake the whole time which made both of us really nervous, but she only let out a couple of short cries while we were eating. I think our plates came out of the kitchen in right around five minutes and the check was left with our breakfast. After finishing up, I took the baby and got her in to the car while J went to the cash register to pay the bill. 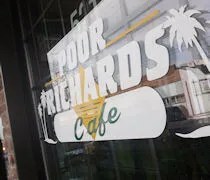 Poor Richards Cafe was a little unexpected. I’m not really sure why no one has told me about the place. Even late on a Monday morning, they had a pretty full parking so I can only imagine what a weekend is like.